Right now we are waiting for new Sylvia ANTONSEN Art to arrive at the gallery. In the meantime, here is a selection of the artist's archived art work which has featured at Red Rag Art Gallery. If you wish to register to receive updates and alerts when new art work from Sylvia ANTONSEN arrives select this link. Sylvia Antonsen was born in Dorset in 1937. 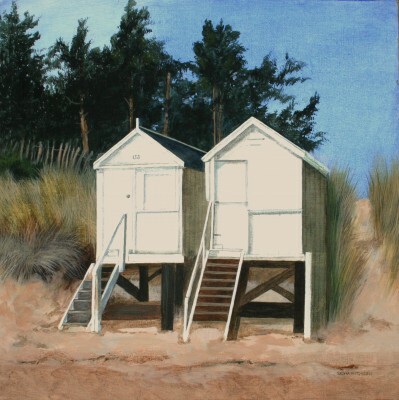 She studied painting at Bournemouth College of Art, obtaining a National Diploma in Design. Sylvia then worked as a designer at the Royal School of Needlework. Antonsen also spent time as a visiting lecturer in Drawing and Printed Textiles at Northampton and High Wycombe Schools of Art for two years. Later Sylvia Antonsen subsequently taught drawing, painting and printmaking until able to resume full-time painting in 1991. 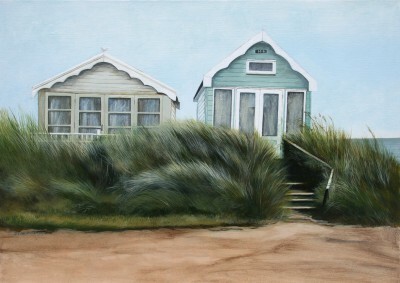 As an artist Sylvia Antonsen has had a recurring interest in British landscape and marine scenes. 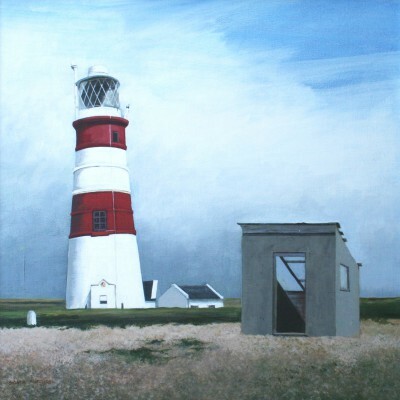 The subjects for Sylvia Antonsen contemporary paintings are often buildings or structures that are associated with shelter or safety on or near the British coast. 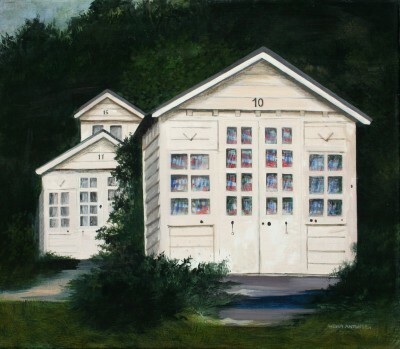 Antonsen particularly likes to find isolated places where she can convey a sense that people have just left. 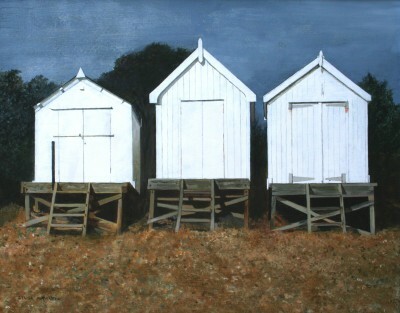 For example: Beach Huts that have been shut up for the winter or boats moored on the shingle. From an art design viewpoint Sylvia Antonsen is also interested in the linear qualities of a subject. 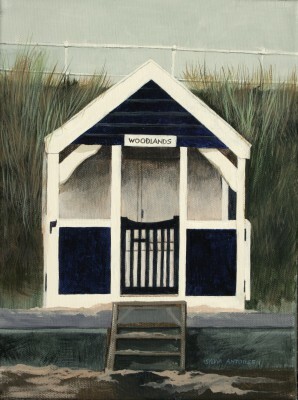 The boarding on beach huts and wooden boats provide a constant source of inspiration for her paintings as do weather boarded houses and lighthouses. 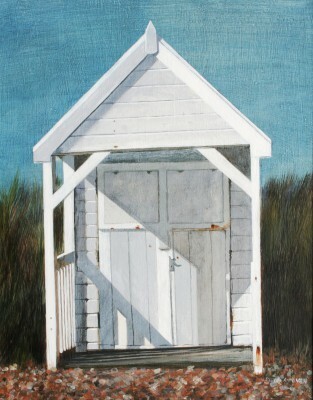 Another motivation factor for Sylvia Antonsen's art is colour and particularly white hues. 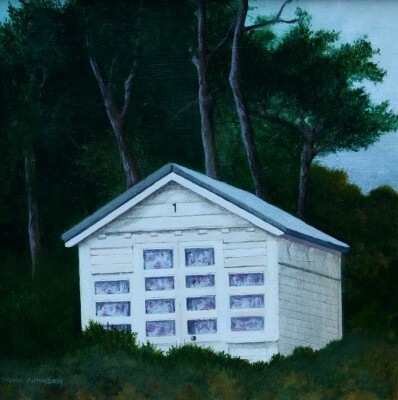 Antonsen enjoys the focus and balance that the use of white and the many variations of white brings to a painting. Antonsen's paintings are not overtly textural and painterly. But Sylvia creates interest by careful build up of thin glazes, sometimes over an initial thick layer of paint with the resulting rich effects. Sylvia Antonsen's Danish heritage is still an influence in her beautiful Acrylic contemporary paintings. 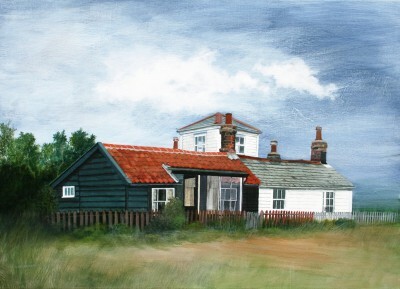 Sylvia produces paintings of calm, atmospheric scenes with remote flat landscapes featuring lone boats in uninhabited marshy areas. Other influences on Sylvia Antonsen have been the paintings of artists Edward Hopper and Paul Nash. Whatever the subject, Sylvia Antonsen creates paintings that are crisp and stark with immediate appeal but they also display enduring qualities. The finesse of Antonsen paintings starts with the basics. 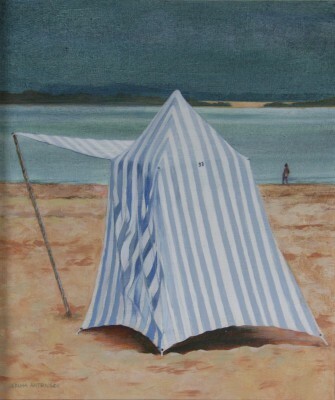 Sylvia uses only the best quality stretched linen canvas and after further careful preparation the finest of brushes to create the precise detailing so evident in her paintings. Sylvia Antonsen paintings are held in many art collections throughout Europe. And in 2004 Antonsen was an invited artist at the prestigious Singer Friedlander art exhibition. 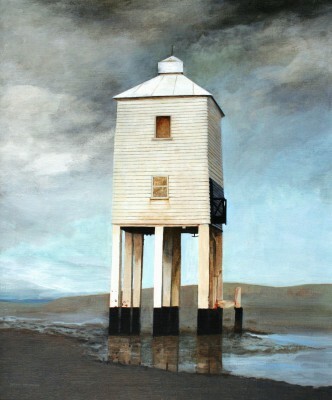 In addition to Red Rag British Art Gallery Sylvia Antonsen has exhibited at other leading British Art Galleries. Each painting at Red Rag is sourced from the Sylvia Antonsen artist studio and like all Red Rag British art and contemporary art it can be shipped worldwide.